On the left, my route to work this morning (about 7.5 km according to Google Earth), and on the right some of the 64 Toyota posters I saw on the way. That’s the equivalent of one ad every 12 meters. 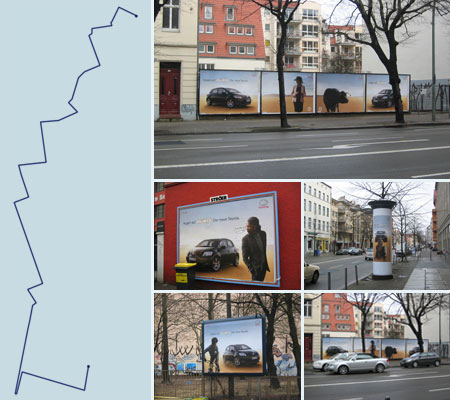 Bus shelters, 18/1 posters, citylight rotary changers and Litfaßsäulen are all plastered with ads for the new Auris, a compact bull of an automobile irresistable to men, women and dogs. Apparently it’s Germany’s biggest ever poster promotion, with a staggering 200,000 posters being hung in all large cities*. FontBlog, a snooty German typography blog, comment that Berlin is effectively advertising-free, if you can irgnore the Auris. Tell SLAB if your city has been infected by Toyota. Tomorrow: a new route, and new numbers. Brace yourselves. * Adendum: reader mkorsakov notes in a comment to this post, that the posters are being hung in all cities with more than 100.000 inhabitants, of which there are 81 in Germany. That makes 16.2 million posters.